“http://makingthymeforhealth.com/vegan-mushroom-bourguignon-2/ ” which called for dried porcini mushrooms. Everything else was mostly the same. 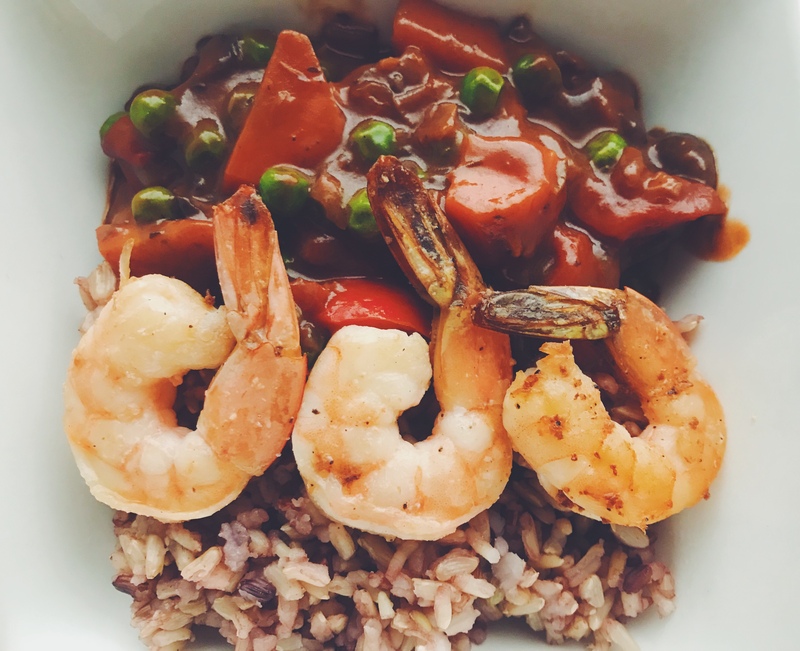 We served ours with Bob Mill’s Country Rice Blend and salt and pepper pan fried shrimp. 1-Add 2 tbsp olive oil in medium flame and add in the onions, peppers, carrot and garlic along with the oregano and thyme, salt and pepper. Cook for about 5 minutes. 2-Add in 2 tbsp tomato paste and push to the side of your pan to make space for mushrooms. 3-Add remaining 2 tbsp olive oil and cook the mushrooms. My pan was relatively small, but I usually get everything to fit anyway. Cook the mushrooms for about 5 minutes (should be cooked but still firm). 4- Add the cup of red wine and simmer for 10 minutes until the liquid is reduced to almost half. 5- Mash 2 tbsp butter with the 2 tbsp flour and add it half dose at a time to thicken the the reduced liquid. Sometimes if you put it in all at once, it could be too thick and goopy. It’s safer to just do half at a time and adjust the consistency to your liking. I added about 1/2 cup of frozen peas for extra crunch and nice pop of sweetness at the end and let up cook for about a minute. I think it married well with the dish. Also, I was too tired to make a side of veggies so it was perfect and super easy add on. The shrimp I pan fried with salt and pepper for about 3 minutes per side. 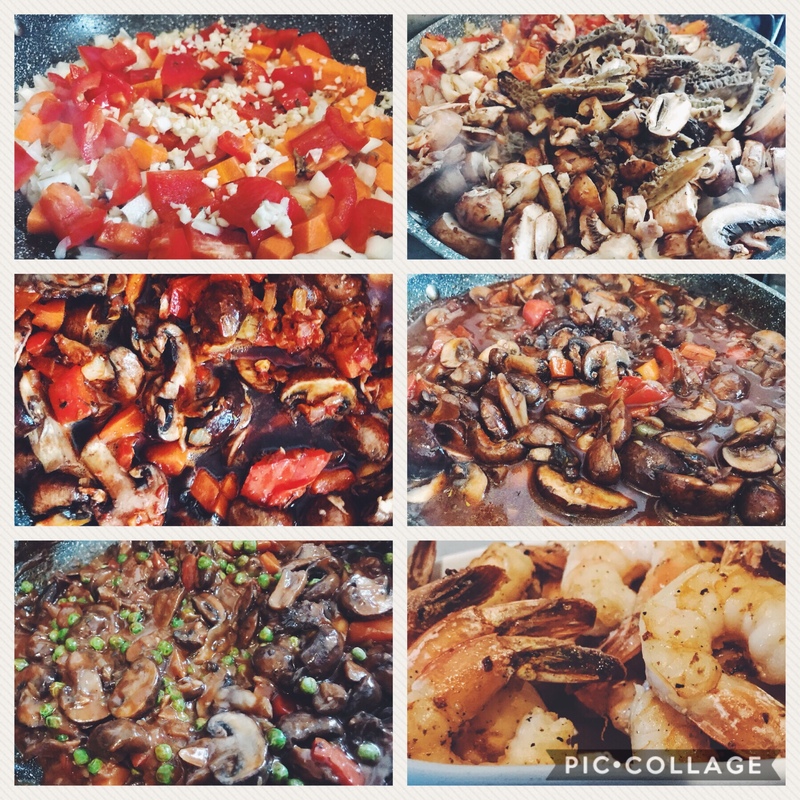 I make a large batch and I can either serve with the mushroom Bourguignon or use the next day for an omelet, linguine, shrimp tacos or whatever I’m in the mood for the next day. Salt and pepper makes the leftover shrimp versatile to reuse! What are your favorite meals for a snowy night in?